Parsley,sage,rosemary and thyme...refrain from the song Scarborough Fair by Simon and Garfunkel was playing in my head as I was preparing the marinade for this pork tenderloin. I love this song when I was teenager.. It was probably through this song that I first learnt the names of the herbs in the verse. I don't think I knew they are herbs and their uses then. However, I am not using all the herbs in the song but the last two, which are rosemary and thyme. And LEMONS! Zest and juice. Dijon mustard and garlic are also added to the marinade, but the way I see it, lemons really, really bring out the best flavor in any dish. This is a dish that requires minimal effort but produces great result. I am pleased the way the pork turned out, moist and flavourful. Pork tenderloin can be quite dry and most people shun to grill or roast the meat. This dish is a good alternative for my many relatives and friends who do not take beef and lamb. Combine the lemon zest, lemon juice, 1/2 cup olive oil, garlic, rosemary, thyme, mustard, and 2 teaspoons salt in a sturdy 1 gallon resealable plastic bag. Add the pork tenderloins and turn to coat with the marinade. Squeeze out the air and seal the bag. Marinate the pork in the refrigerator for at least 3 hours but preferably overnight. Remove the tenderloins from the marinade and discard the marinade but leave the herbs that cling to the meat. Sprinkle the tenderloins generously with salt and pepper. Heat 2 tablespoons olive oil in a large oven-proof saute pan over medium high heat. Sear the pork tenderloins on all sides until golden brown. Place the saute pan in the oven and roast the tenderloins for 10 - 15 mins or until the meat registers 137 degrees at the thickest part. Transfer the tenderloins to a platter and cover tightly with aluminium foil. Allow to rest for 10 minutes./ Carve in 1/2 inch thick diagonal slices. The thickest part of the tenderloin will be quite pink (it's just fine) and the thinnest part will be well done. Season with salt and pepper and serve warm or at room temperature with the juices that collect in the platter. Strain, serve, pouring sauce over pork slices. Note: I cooked one portion of the recipe, 500g of pork tenderloin. This serves approximately 2-3 persons. This is a versatile dish where you can cook for two or twenty. It can be served hot or cold. Good with leafy salads. Use a meat thermometer to check doneness. For dessert, I made Fruity lemonade popsicles using freshly squeezed Meyer lemons. Lian, your pork tenderloin looks so so good with all the herbs and lemon. I can imagine how soft and tender it must be with the lemon juice marinade. I'm bookmarking this to make very very soon!! :) Your popsicles look so refreshing! 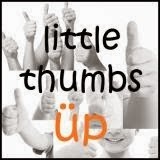 I love it :) Thanks for participating in Little Thumbs Up!! Hi Grace, This is good. Son requested me to cook this dish again. Your very-lemony meal looks wonderful. Thanks Zoe. I love lemons in my cooking too! The pork tenderloin looks really tender and juicy! I dn't think I've roasted pork tenderloin before, gotta try it one day. Like your popsicle too. Happy Valentine's Day! PS Regarding the question about instant yeast u left on my blog, I forgot to type in fresh or instant yeast can be used. As per other bake breads, the instant yeast can jus be reconstitured with warm water. Thanks Yen. Will try the pita bread soon. Try this recipe too, pork is indeed very tender and juicy.